1. Just like that we are near the end of August and about to say so long to summer with one week to go before school starts again. When Ethan was asked at his well-visit what the name of his favorite school was with no hesitation he blurted out homeschool. Sorry Ethan, but you are already enrolled and registered for your second year at a fabulous school that does not involve mom teaching. Needless to say they are not ready for school to start again. August has been the quickest moving month this summer hands down. Last year the month took forever as I anxiously waited for Caden’s arrival and this year I blinked and it is practically over. 2. I am in denial that the boys will be starting school soon. Believe me there are those days that all of us know where the struggle is real and the patience is thin and we cannot wait until they are back in school again. For some reason I mostly feel that the summer went by too fast and am left wishing for more time with them. Our summer was packed and filled with a lot of fun memories, but still I wish I could squeeze a few more in. I may find myself shedding tears in a week. 3. We just finished a sweeps week of celebrating and now feel like everyone needs a little detox from sugar, myself included. Started last week celebrating Kolbe’s name day, St. Maximilian Kolbe’s feast day with ice cream cones. 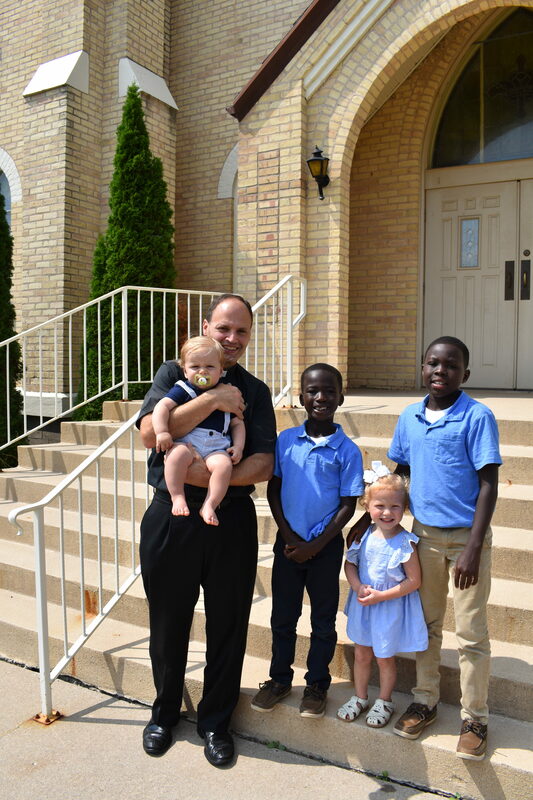 Of course there was the feast of the Assumption followed by Kolbe and Ethan’s baptismal birthday and then on Friday we had a wonderful visit with Aaron’s brother, Fr. Chad who is a priest stationed in France and home for a two week visit. The week led up to Ethan’s birthday, a family gathering and my mom flying in to stay with us for the following week. 4. It was such a blessed time that we were able to spend with Fr. Chad. To have such a joyful, holy presence for my sons to witness and inspire Aaron and I in our own faith journey and family life. He reminds me of a modern day St. John Bosco, inspiring the youth and bringing Christ to them and doing it with wit, jokes and fun. He topped his visit off with a great surprise announcing he will be stationed stateside in Chicago for the next few years, we feel so blessed and are incredibly grateful for the opportunity to see him a bit more!! 5. Ethan turned eight!! How is he eight already! (I now realize I say that with each kids’ birthday.) We celebrated by taking in a game of his favorite sport, baseball. Tailgating before the game and staying late to catch the fireworks at the end. He even got his name on the big screen with a “Happy Birthday” wish from dad and mom which put the biggest smile on his face ever, wish I would have caught it on camera. Love you to pieces Ethan! 6. I am so grateful for the opportunity to have been able to go away on retreat. It was a beautiful time to be still with a lot of moments for prayer and reflection. I also realized just how important community is in this game of motherhood. I was able to connect with a group of beautiful women and I am so grateful for their friendship. 7. My mom has been visiting us this week and it is always a reality check when she leaves. She spoils us all week from amazing dinners to helping around the house to fun activities. I am sure going to miss her when she leaves and I know the kids will miss waking up to her in the morning. If you read all seven, impressive! I apologize for getting a little lengthy. Happy Friday, my last one of summer! Linked with Kelly for more.